Hey everyone! I was drawn to today's Manicure Monday shade because it had a sparkle and fire to it without being a glitter like last week's color. As easy as it is to remove glitter polish, I still wanted to give my nails a little breather from the grit of removing those shimmering specks. The great thing about glass-fleck shimmer is that as gorgeous as it is, it's easy to remove too and I thought this coppery orange would be a lovely choice for today. 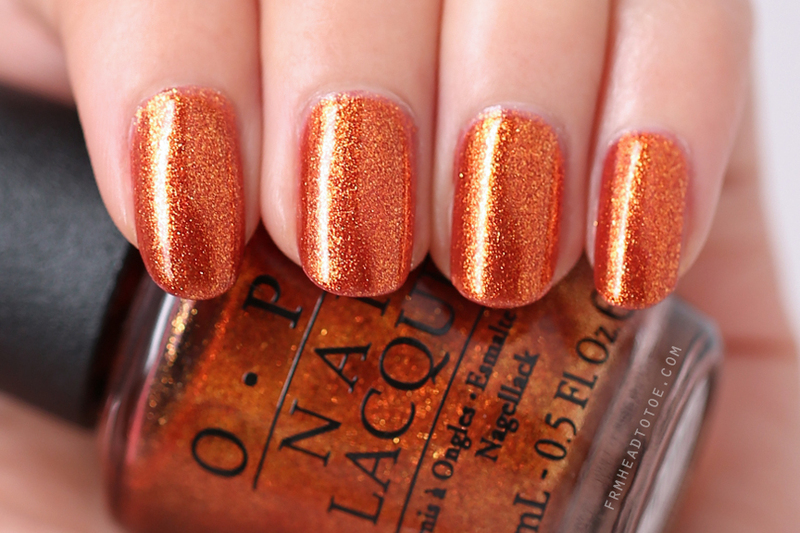 Let's check out OPI A Woman's Prague-ative below! 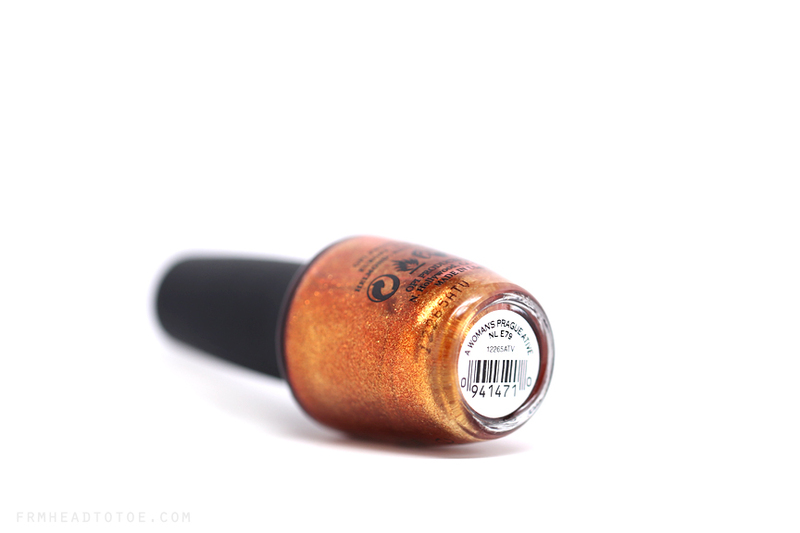 Under the bright artificial lights that I use to shoot my nail photos, the polish becomes a gorgeous tangerine but it also changes personality completely under dim lighting to a very metallic, bronzy glow. Although I love the very cool effect, I will also honestly say that I don't find this particular shade to be the most flattering on my skintone. Here, I used a base of OPI Nail Envy, 3 easy coats of A Woman's Prague-ative, and Seche Vite Top Coat to lock everything in. Application was a smooth process. If you are a fan of metallics and tend to lean toward warm oranges and coppers, I definitely recommend A Woman's Prague-ative as a pretty option. As a fair warning, I can see this looking generally better when I am lighter with pinker-tones versus when I am tanner and more yellow-toned because it really pulls the yellow from my skin so it's something to take into consideration if you are very yellow like me. Otherwise, it's an overall very nice polish. Readers, what is your favorite metallic shade to wear on your nails? Do certain colors look particularly good or bad against your skintone? Let me know in the comments! It's really pretty! :) I also like glass fleck polishes because they're glittery but easy to remove. Gorgeous! And for my skin tone, blue's usually look bad >.< But I'm still yet to find my favourite metallic shade! I have this polish and I love it! It actually looks good on my skintone, and mine is close to yours (NC30). The color from my bottle leans coppery and looks more like a burnt orange versus a bright tangerine like yours, so I'm not sure what happened. Love a good orange polish and bonus that it's glittery too. By the way, you misspelled the name! It should be Prague - G-U-E. Sorry to be picky but I thought you'd want to know! Es precioso, los naranjas no me van mucho pero este es increíble. Hi Jen, do you have any recommendations to make your nail polish last longer? Regardless of the brand, my nail polish lasts about four days using Seche Vite top coat and no base coat. Please provide feedback, thanks. this is a beautiful color, Jen. And I just posted my very first blog on my page. It is about my new manicure color. Not much but it is all inspired by you.